Sorry... the 2017 Volvo XC90 Hybrid is no longer being sold as new. 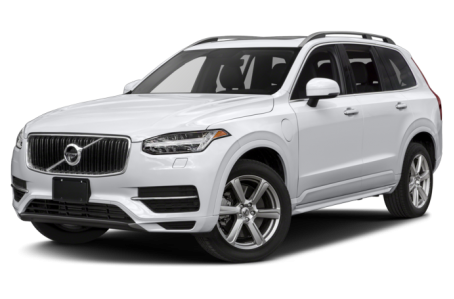 Instead, take the first step to a great deal on 2018 Volvo XC90 Hybrid with a free price quote! The plug-in hybrid drivetrain of the Volvo XC90 Hybrid uses an electric motor to drive the rear wheels while a supercharged and turbocharged four-cylinder gas engine runs the front wheels. Total system output is 400 horsepower and 472 pounds-feet of torque, according to Volvo. With a full charge, the electric motor is capable of powering the XC90 Hybrid for about 25 miles in a driver-switchable electric-vehicle mode. Redesigned last year, the XC90 is Volvo's flagship SUV. It seats five people in two rows or seven in three rows, depending on the model, and comes with front- or all-wheel drive. It's powered by a choice of four-cylinder engines, one of which is supercharged and turbocharged. Competitors include the Audi Q7 and BMW X5.